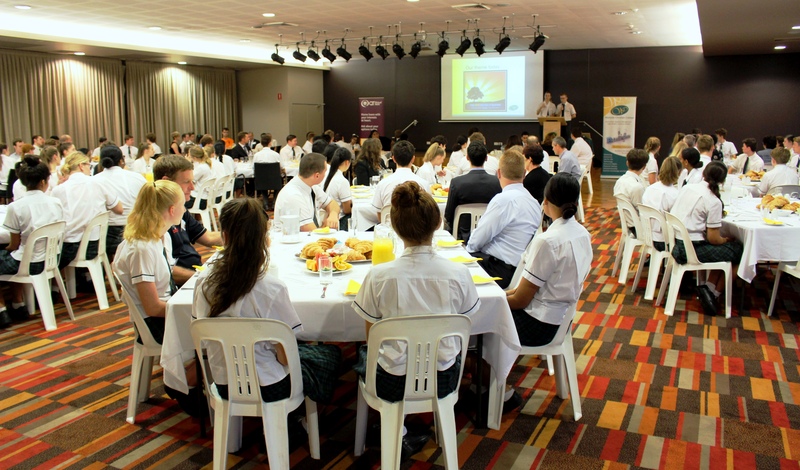 Westside Christian College’s annual Business Breakfast is becoming big business. On Thursday 16th March, more than 100 students will have the opportunity to learn about the corporate and charitable world. More than just a networking event, students with have the opportunity to learn more about the corporate world by talking directly to a number of industry professionals at the Breakfast. Business, Legal Studies and Accounting students will gain valuable insight into what life is like after high school by chatting to the professionals and asking an array of questions at the Thursday event. Placed at different tables with industry professionals and university students, Westsiders will have opportunities to ask about further study and tips to get their foot in the door with future employment opportunities. From international to small business, the professionals have backgrounds in journalism, law and business and marketing. Most exciting of all is the keynote speaker, Orange Sky Laundry founder, Alex Jacoby. Providing laundry services and genuine conversation for the homeless and houseless, Orange Sky Laundry has risen to become the face of 21st century innovative services for those on the outskirts of society. This is the fourth year Goodna RSL has hosted the event. For more information, contact Mrs Karen Pike, Accounting and Business Studies teacher. Westside Christian College. Achieving. Belonging. Caring.